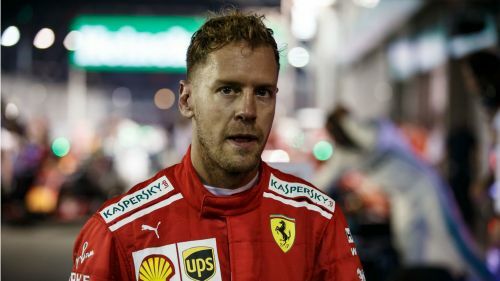 Sebastian Vettel says Ferrari gave themselves no chance of winning the Singapore Grand Prix after giving up more ground to Lewis Hamilton in the Formula One drivers' championship. Vettel finished third behind Hamilton and Max Verstappen to fall 40 points behind the Briton as hopes of a fifth title begin to fade. The German's chances were severely hampered by an ill-judged early pit stop that put him on ultrasoft tyres - contrary to the choice made by Mercedes for Hamilton - and saw him rejoin behind Verstappen, having overtaken the Dutchman on the first lap. Vettel made it to the finish but was 40 seconds adrift of Hamilton by the end of the race. "Overall we were not fast enough, we didn't have the pace in the race," he said. "We tried to be aggressive in the beginning and obviously it didn't work out. "Red Bull did very well to react and jumped us. It wasn't too much that was missing, but with those tyres the main priority was to make it to the finish. "The strategy was to get ahead of Lewis, which didn't work, and it was a pity that we lost the second place. Then the main focus was to maintain the third position. "I wasn’t very confident we could make it to the end, but it did. It was surprising to see that Valtteri [Bottas] was not able to keep it up and he was struggling more than I was. "It was clear we were not fast enough in the race, we need to understand why. Vettel was reluctant to criticise the decisions of his team too heavily, though. "I will always defend the team. The decisions we took in the race, to try and be aggressive, were to try and win the race and when it works it’s great," he is quoted as saying by Sky Sports. "But overall we had a very strong package, both Kimi and myself looked very competitive throughout practice, but in the end the race result we finished third and fifth. Like yesterday, not where the speed of our car belongs. "That’s what I mean when I said we didn't get everything out of ourselves. "Lewis said he didn't expect to come here and gain 10 points and we probably didn't expect to lose 10. "I never believed we had the fastest car by a big margin as people said - I know we have a good car. "The speed is there and today, if anything, we were a little bit slower. But it's difficult to draw conclusions as I had a very different race. "I don't think we have any tracks to fear that are coming, so no need to be afraid of what's coming."